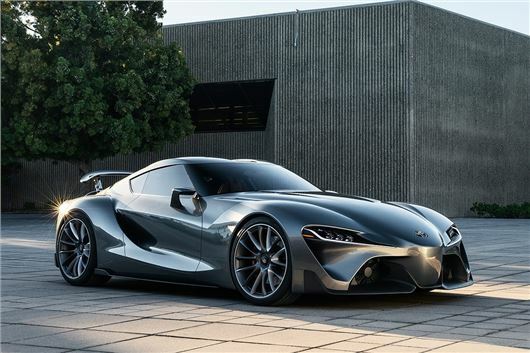 Toyota has revealed a new version of its FT-1 concept car, designed to look more like a potential real-world production car than a complete flight-of-fantasy. The design hints at a potential new high-performance car - perhaps a next-generation Supra - however there is no word on when or even if it will go on sale. The previous FT-1 concept wore a more striking red colour, but the new model has more subdued graphite grey paintwork. The interior has been revised too, with saddle tan leather details which are designed to give a more sophisticated feel. The designers took their inspiration for the interior from superhero costumes – specifically the more modern interpretations of characters like Batman or Spiderman, which use high-performance sport materials in place of bright, garish fabric. From September, those who play Gran Turismo 6 on the Playstation 3 will be able to download both the grey and red versions of the FT-1 to drive in-game, along with more performance oriented Vision GT edition of the car. You can read more about the FT-1 Concept here.